Girl of Fire was such a wonderful read, one that is going to be quite hard to review due to the high spoiler risk attached to this story. The first novel in The Expulsion Project series, introduces us to a wonderful cast and many brilliant worlds. From the get-go, we’re given so much, left with so many questions and expectations. You’re never quite sure where things will go next, constantly on the edge of your seat regarding the storyline. With multiple storylines taking place, with many different aspects playing out, you’re pulled in from start to end, left wanting so much from the future books. Our story begins when our main character, Trattora, is a child. We get to watch as her destiny is decided, to some degree, by the choices her parents make. To save their children from a terrible fate, a heart wrenching choice is made: the children are sent off into the unknowns of the universe to save their lives. We get an indication of why this happened, we understand the dangers, and yet we have some questions. Questions that will remain with us for the entirety of the book, and will hopefully be answered in the future books. It really is a vital part of the book, despite how little space it takes up, and leaves us with many thoughts regarding the future of the series – so don’t be dismissing the start of the book, despite how the rest of the book really pulls you into a very different kind of story. Having been pulled in so deeply through this introduction to one part of the universe, I found the shift of the story to have a somewhat slower pace. We get to see Trattora years later, as we come to understand a completely different part of the universe. The world building here is truly amazing, and the development of the characters was a lot of fun, but the pace did seem a bit slower than I would have liked. We started with such action and the sudden slower pace felt like a bit of a brick wall. It was necessary for us to understand the world and the characters, but you can feel the difference.Fear not, however, as it does not take long for the story to get going again. Once it does start to move, the action is never ending. So much happens within this one. As I’ve already said, there are so many storylines intertwined. Each one adds something – action, mystery, suspense, romance, and much more – whilst being brilliantly connected to the rest of the story. Everything happens for a reason. With so much going on, it is easy for things to fall into the background, but such does not happen with this one. Even when we’re following one storyline, we’re still following information that will help us understand aspects of another storyline. I really cannot begin to explain how wonderfully the story comes together. As wonderful as the storyline is, it pales in comparison to the world building. We get to see so many different worlds throughout this book, so many different cultures, and each brings something new to the table. I really do believe the world building was my favourite aspect of the story. I enjoyed it all: but the world building really stood out for me. I feel as though in future books we’ll probably be seeing fewer worlds, but after getting to see so many in this one I’m hopeful for what the yet to be visited worlds will bring. One thing I will say, though, is that I don’t think this is quite advertised properly. Whilst it’s a wonderful story, it’s not quite the same kind of story as Divergent leaving me feeling as though that isn’t quite the right book to use. It’s a wonderful book, yes, but it has a very different feel to Divergent and the reference to the Divergent series – advertising it for those with a Divergent withdrawal – will leave people expecting something very different. That’s just my view on the matter, though. Overall, it was a wonderful read. Norma Hinkens has completely pulled me into The Expulsion Project world with just this one story, and I cannot wait to see what comes next (in fact, a part of my mind is hoping for more than just the main series and is hoping for many short stories to tell the tales of the characters I’ve come to really love). I really am super excited to see how events play out – with all the action in this one, we’re promised even more in the next book. As a final note, I would like to thank the author for allowing me the chance to advance read this story. 5/5 StarsWhat an amazing and intricate Sci-Fi novel! Norma Hinkens has this fabulous way of writing her world as if the reader is actually living it. Though there is technology and customs that the readers do not know, she is able to write the explanations in a way that it doesn't seem as if she is explaining things. It's more immersive rather than descriptive.And the plot is rather unique as well. Yes, we all know the general "AI becomes self-aware and takes over humanity" story-line, but Norma Hinkens goes beyond that. This novel is more about the journey of Trattora and her quest to save her people. The AI actually has very little to do with the overall plot in this first installment.Plus, who doesn't love reading and watching the characters' growth throughout a novel? Every character was super fleshed out and real. They had their faults and some were also easily disliked (looking at you Sarth). But then there were others that you dislike and feel odd about at first and you grow to love. The character connections throughout this novel were phenomenal and intricate. I highly recommend this book to anyone who is interested in the Sci-Fi genre. It is a good novel to introduce you into the genre, as well as a good novel for long time Sci-Fi lovers! This is an engaging space adventure with a teen and friends seeking their true identities. Trattora is a teen with red hair which sets her apart from the white-haired people of her clan. She was fortunate to be adopted by the Chieftain but she has always yearned to know her true history. Few vessels visit their ‘rural’ planet so Trattora is thrilled when a damaged mining vessel lands. The community can’t offer much help, but Trattora tries to find something to trade. She shows the miners unique rocks that are part of the clan’s sacred grounds. The captain believes the rocks are valuable and they are discussing a deal until a clan elder uncovers a terrible secret aboard the miner’s ship.Trattora has become interested in Velkan, a crew member who is an indentured serf who had no choice in the captain’s illegal cargo. Trattora is set on helping the crew to escape when news of a marauder’s attack reaches the village. Trattora, her best friend and a young guard are unable to make it to the cavern shelters so they escape on the mining ship. Trattora thinks she has made a deal with the captain but she will learn that you can’t trust a corrupt trader.Trattora discovers Velkan has a birth bracelet like her own. This, and their chemistry, draws them closer as Trattora insists they discover the secret of their birth families. They face betrayal and danger, steal a ship – or two -- and find another bracelet owner as they pursue their past. Their new friend helps them to decipher the code of the bracelets which tells them that a powerful AI project was taking over their home planet fifteen years ago. Now they are all determined to try to rescue their families.The world building in this story is creative and engaging. The characters are developed – some likable and some not. Although I enjoyed the story for the most part, the situations and solutions stretch the realm of believability. Trattora is a naïve girl who has little experience with evil or mechanics. Still, she has read all the books she could find about space flight so when it comes time to snag a ride on her first space ship she not only feels at home, she can take the controls. She manages to negotiate with illegal traders and escapes their betrayals only with the help of her friends. This sort of ‘good fortune’ happens repeatedly as Trattora rushes headlong into dangerous societies. It is fortunate that she gathers other skilled companions around her in addition to Velkan.The crew does have a diversity that reminded me a little of Firefly (not Hunger Games or Divergent). Although I struggled with the apparent foolish actions, those actions kept the group moving forward and provided surprising twists along the journey. I suppose it is a gift of fantasy and sci fi to be unrealistic and still be fun. There is a conclusion even as the ending leaves an appropriate opening for the next book. Readers who enjoy fast paced, teen adventuring sci fi should give this series a try.I received this from the author for an honest review. On a mission to save the people and the only home she's ever known. Trattora has always known she didn't really fit on her home planet of Cwelt or with her adoptive family, yet, it is the only home and family she has ever known. The only thing she has of her birth family or planet is a small bracelet with her name on it.So imagine her surprise when she meets an intriguing stranger who just happens to have an identical bracelet with HIS name on it! As her home planet is being invaded she saves her new friend, Velkan, and his shipmates - and begins a journey across the stars. A journey that she hopes will result in the saving of her adoptive planet & people as well as finding answers to her origins.This story pulled me in from the first page and took me on an interplanetary journey - meeting new friends and foes along the way. Trattora & Velkan are both likable characters and I enjoyed watching them grow and watching their relationship grow as well. They showed both maturity and naivety of those stepping out on their own for the first time. They also seemed to use their heads and hearts when caught in a treachours situation.I am looking forward to reading more of their adventures!I voluntarily and honestly reviewed this Advance Reader Copy. “Girl of Fire” the first novel in Norma Hinken’s imaginative sci-fi, dystopian trilogy opens as scientists fearing for the safety of the children send them into space. Years later on Cwelt a fringe planet in the Netherscape Trattora the adopted daughter of the Cheftain finalizes a bargain for passage on the Zebulux a rogue trading ship headed for Aristozonex just before the Maulers attack. Determined to save her people who have escaped underground she brokers a deal with the oremonger on the trading ship for part of the highly coveted and valuable dragonite stones plentiful on Cwelt, hoping to sell the rest in Aristozonex and bring back a fleet of warships. What she discovers all too quickly is that Sarth’s not to be trusted, has her own plans for the dragonite and for ridding herself of the Cheftain’s daughter.In a high stakes adventure as Trattora struggles to find a way to win her people’s freedom from the invading Galactic Pirates she uncovers clues to her past when she finds a birth bracelet like her own in the cabin of Velkan, the indentured serf on board the Zebulux. Learning of the Expulsion Project on her home world that forced her birth parents and four others to sacrifice their children, sending them away before the Artificial Intelligence software ruling their planet could use them for its nefarious purposes, Trattora finds herself caught between saving the parents she knows and those that made a great sacrifice to spare her life. In an innovative and exciting plot Norma Hinkens draws you into a world of pirates, oremongers, androids, cyborgs and the Syndicate who keeps the peace and makes laws that govern the territory under their jurisdiction. The story heats up when Trattora not only discovers that the sacred triangle of luminescent stones on her primitive planet are valuable and highly prized, but is determined to use some of them to buy an armed force to rescue her people from the Galactic pirates invading Cwelt. Intensity and suspense escalate not only when she and her best friend Buir escape from the Mauler attack on the oremonger's ship, but has to cope with the duplicity of Sarth who’s determined to take the dragonite for herself. The tension and action never slow as Trattora struggles to escape Sarth’s clutches only to have to navigate through the dark, sleazy Galactic underworld so that she can find a buyer for the dragonite, and clues to the identities of the children who were sent to freedom.In this story the characters become more complex as they struggle with each new challenge, developing strengths they never realized they had. On the planet Cwelt teenage Trattora struggles against the ambitions and conniving of Parthelon, a man determined to be the next leader of her people. Impulsive, reckless but fearless she takes chances as the adventure progresses, but in doing so begins to develop leadership qualities and a sense of responsibility. Attracted from her first encounter to the intelligent and amiable Velkan who has no liberties as a serf, sparks soon fly especially after Trattora learns that they both are originally from the same planet. Although I sensed a deepening of their friendship because of a shared past this part of the story I wasn’t swept up in, although that might change in the next novel. There are several unforgettable minor characters like Melus the duty-oriented, loyal and self-sacrificing guard who saves Trattora’s life; Ghil the blunt and feisty chef whose only recipes are for mush and mash; sweet and adaptable Buir; and treacherous, dishonest Sarth; all infuse this story with their brand of energy, passion and help make it a page turner from beginning to end.Fast-paced and action-packed “Girl of Fire” blends scify adventure with a small dose of romance that keeps you riveted and I will be interested to see where Norma Hinkens will take Trattora and Velkan’s thrilling quest next. Trattora lives on the planet Cwelt with her adoptive parents; the chieftain and his wife. Trattora was adopted from traders’ years ago. Although she has always loved and cared very much for her adoptive parents she has always wanted to know who her birth parents were and where she came from. Trattora is the next in line to be leader after her father as chieftain of Cwelt but she has always wanted to have her own ship so that she could travel the universe and explore other planets. One day a trader ship comes for a visit on Cwelt and is hoping to make a big discovery on the planet that would make them rich. Trattora and her best friend play host to the traders while they are snooping around their planet. Trattora in hopes of one day owning her own ship like the traders and thinks that if the traders find what they are looking for then her dreams may come true. But before her dreams or the traders are fulfilled Cwelt is attacked which sends all of Trattora’s people in hiding. Trattora and her friend don’t have time to make it to their hiding place so they hop on board the trader’s ship to escape and hope to return one day to save her people. Trattora’s dreams are finally coming true in a way she is getting to travel on a ship but just not the way she planned. But Trattora is a tough girl and makes the best of the situation that she is dealt. Now Trattora’s plans are to get her own ship, travel around the universe, rescue the people on Cwelt, and find out who her birth parents were but not necessarily in that order.I will have to say that I have truly loved traveling from planet to planet with Trattora and all her friends. I felt as if I was visiting old friends again myself like Spock and Captain Kirk and flying around on the Enterprise. I enjoyed reading about all the different technology and learning all the words but I would like to have had a list or index to refer to on occasion to help keep my mind refreshed on what their meanings were. If you like reading science fiction or traveling around the universe or like old shows like Star Trek then I think you are going to love Girl of Fire and its new trilogy The Expulsion Project I know I am. I can’t wait to read more about The Expulsion Project. *Note : I was given a free Advanced Review Copy of Girl of Fire in exchange for an honest review. This in no way affects my opinion of this book in any way, shape , form, fashion , or thought. All words below this note are my own opinion. * I am constantly blown away by Norma's writing style and this just completely blew me away again. The world that this novel is based in is amazing , and it captured my attention almost instantly from the beginning of the book. The characters , the small bits , and everything in between in this book was amazing , and I COULD NOT put it down until I had finished it. I can't wait for book two. There's so many twist and turns in this thrilling sci-fi adventure story. I enjoyed the journey the characters are on and can't wait to read more. It did take a little bit for me to get into but I am interested to see where the story would go from here.I voluntarily reviewed an arc from the author. Trattora’s father, Oka, would give her up as a three-year-old child in the hope she'd survive to be afforded a better life. Not that this made his heart-wrenching decision any easier to bare. Nor the past twelve-months of covert planning, knowing it'd be the last year he'd ever get to experience her life. The life support pod Fir connected her comatose little body to, that which would carry and keep her alive whilst on her journey, brought a shiver to his very marrow as he noticed how eerily similar it resembled a burial casket. If she survives the perilous journey through the Netherscape and undetected by the Maulers, she'd be deposited on an inhabited planet within the Syndicate's jurisdiction; with no more than her name and date-of-birth to indicate from whence she'd come. That he'd experience no more of her firsts causes his breath to catch at the soul-destroying inevitability. To hide any evidence of their manipulations, the laboratories they worked in would be vaporised in an well-timed industrial accident the moment the expulsion pods were jettisoned. Thus any trace of their births would be forever removed. They could but hope their race would live on via their children, even if it weren't to be on Mhakerta.The self-actualising software, Genocidal Artificial Intelligence (GIA), which had named itself Preeminence, is on the verge of completely taking over Mhakerta. Leaving the Advanced Scientific Research Institute (ASRI) with no alternative. Had Oka and Fir not been among the elite who knew the truth of the hostile takeover, then even this poorest choice would not have been possible. Like the rest of Mhakerta, Trattora too would cease to exist in her present form. The AI that is Preeminence had hatched it's plan eighteen-months ago to assimilate all people with IQs of one-hundred-and-ten or more into it's mainframe. They'd been unable to devise any way of duping it's absolute accuracy in screening.He and his most trusted colleagues had devised a plan to prevent Mhakerta's gifted children from becoming the first batch of scientific soup in their new world order to come. It relied on their fast identification and subsequent evacuation, as is now happening with his own daughter. Fir’s four-year-old son, Velkan, is simultaneously being evacuated to a potentially better life. The risks were great but the alternative was unthinkable. These two treasures wouldn't be the only ones departing, various colleague's young sons and daughters were among the evacuees. But like any parent, they were the most important to Oka and Fir. Some had not been able to face the horror of what they were about to do. Some had agreed, only to pull out in the last weeks before they carried out their well choreographed final plans. They could hardly begrudge those unable to give up their children, but to those given the chance and who went through with it, it was the only choice they could live with.Years later on the outer reach planet of Cwelt, Trattora is approaching her late teens and her pod was found by a primitive culture of hunter gatherers. Whilst Cwelt is not under the jurisdiction of the Syndicate, as Oka and his colleagues had hoped, Trattora nonetheless gained significant protection when the chieftain and his wife, unable to have children of their own, adopted her much younger self from traders stopping on Cwelt. Dreams of technology and adventure have racked Trattora her whole life, and even though she may be next in line for the position of chieftain, despite not being a Cweltian, she chafes at the seams of her culture's subsistent way of life.When a trading ship lands on Cwelt, the first in many years, the crew is found to include an indentured worker (a serf) named Velkan. Trattora is immediately drawn to Velkan, who tells her he was discovered on another planet outside the Syndicate's reach; by the captain of the trading ship when he was still a toddler in the expulsion pod from Mhakerta. Neither he, the captain nor Trattora knows of the origin planet, and the captain won't even reveal on which planet she found Velkan. Although she does claim to have traded his pod for a small fortunr on the central planet within the Syndicate's jurisdiction.Unfortunately for Velkan and Trattora, who was entertaining visions of obtaining technology through trade with the crew, her father's chief advisor covertly searched the ship and found them to be carrying highly illegal stock outlawed by the Syndicate, on pain of death if caught. Parthelon has sought to undermine her progression to chieftain for her whole life on Cwelt, out of jealousy for the role he believes his own entitlement exceeds. Trattora's advocacy of trade, believing that Cwelt needs to obtain security resources to protect them from Mauler raids and slave trafficking, especially following the news from the trading crew that a neighbouring planet was only recently subjected to the same demise by maulers, makes her position weak in the face of their elders.Indeed, despite the advice of her closest confidante, Trattora wlaks straight into tge machinations of Parthelon. Worse still, the crime the crew is deemed guilty of by the elders, is one requiring execution without any form of trial. In arguing for Velkan and some of the crew on the grounds they work for the ship's captain and therefore have no authority to stop the crime from taking place, she further promotes Parthelon's stance that she lacks the cultural understanding necessary for her future role as chieftain. Seeing herself as left with no other options Trattora makes plans to facilitate a rescue and escape effort for the Velkan and any others of the crew she can help, excluding the captain; Trattora abhors the crime she places at the feet of the captain and thus believes she is guilty regardless of her desire for Velkan to be exempt from the proposed justice.Irrespective of whether Syndicate ruling requires the whole crew be held accountable or not, Trattora does not accept that someone with no more authority than a slave can be among those at fault. With the Cweltian form of capital punishment being particularly gruesome, she knows she must find a way to prevent Velkan from falling victim to their method of execution. Unlike any thing she has ever encountered before, when either Velkan or herself come in physical contact with each other, there's a tingling sensation at the point of contact; as though her body recognises something her conscious mind does not. Having seen only one occasion in her whole life on Cwelt when someone was executed, her instincts require that she save Velkan. As to where such a choice will lead her life, Trattora foregoes such worries until after she finds a way to save his and/or their lives.A blending of some well recognised elements, such as those encountered in other scifi such as Terminator (skynet - preeminence), Farscape (maulers - reavers) and Star Wars (syndicate - the empire; and the galaxy system herein). A compact economical writing style is easy to read and understand, but there is a need for an active imagination when considering the number of technological jargon included in the book. This latter statement is far from being meant as a fault in any way, its an astonishing number of technologies and gadgets that are constructed in such a holistic approach. I'm sure there's plenty of people reading and writing scifi who haven't the breadth of experience to come close to parts list of the story.I'm a little surprised there's not an alphabetically organised glossary/appendix detailing the technologies at either the front/rear of the book respectively (said with only humorous intensions). Trattora's certainly a budding inventor at heart, and takes after her scientific biological father whether she knows it or not. The same can also be said of Velkan. Forgetting the Jedi and light sabers, Trattora reminds me a little of Luke Skywalker: he was idealistic before the empire got to him, he was adopted after all, and only needed a quick look at any technological gadgetry to be able to get it working the way he wanted. The contrast between the native Cweltians and the traders seeking mining rights on Cwelt does also bring to mind the juxtaposition found in Avatar, although it never really eventuated into an as well explored concept. The subservience of less technologically advanced cultures at the hands of those with more is however a theme. I typically go for more fantasy oriented science fiction-fantasy, but I was entertained and enjoyed the read greatly. I voluntarily reviewed an ARC copy of this bookTrattora was one of five young children sent in escape pods by their scientist parents before their planet was enslaved by artificial intelligence. She was adopted by the chieftain and his wife of a remote planet. While her planet is being visited by traders for the first time in years, the planet is attacked. Trattora and her best friend, Buir are forced to escape with the traders. Before leaving she made a deal with the ships captain for a valuable mineral on her planet. Her motives are pure. She wants to save her people, but the captain is motivated purely by greed. Trattora is drawn to a serf on the ship, Velkan. As they get to know each other it turns out that they have more in common than expected. When the captain betrays Trattora; she, Buir, Velkan, and Ghil steal the ship and head to the main planet to sell the mineral and get help for her home planet. This is a book of twists and turns, danger and intrigue. It's non-stop action and we pick up a few more "common" characters along the way. It took me a bit to get into the book, but once in, I was hooked. With so much happening, I couldn't put it down. I would have liked more romance development between Trattora and Velkan, but Buir and Ghil made up for it with their sweet, unexpected friendship. The book mostly closes the first storyline and sets the stage for the next one. It should definitely be equally entertaining. Trattora is the adoptive daughter of a Chieftain. Velkan has been an indentured serf his whole life. Together they end up fleeing her planet from pirates on a beat up mining vessel with more secrets than is safe. They find out they have more in common than they first realize and work together to find out the secrets of their past and Trattora is also determined to free her planet and people. This is the first in a series and does end with a cliffhanger. Personally, I couldn't put this down and can't wait to read the second book when it finally comes out. This is a book that will go on my shelf to be read many times over! Let me start by saying...Wow! I was pulled into this story from the start, hurtling through space and danger alongside Trattora and her rag-tag group of friends, old and new. Reminiscent of Firefly (a favorite show of mine) it helped fill a void with its space chases, piracy, illegal actions, and even romance. I was greatly saddened when the story came to a close and I look forward with much anticipation for the next book in this series. Having never read this author before, I didn't know what I was getting into, but thank you Norma Hinkens for the ARC for now you have a loyal reader of your work. Wow. This is a great book. I'm not going to summarize it as, frankly, I'm too afraid of spoiling something, but I will say that the universe building here, with its many diverse worlds, is fabulous, the lead and supporting characters extraordinarily well crafted and the well written plot superbly thought through. Is that enough superlatives for you? This book deserves them. Highly recommended. Pretty good! So action packed that parts of it it seemed a little contrived, but very enjoyable nonetheless. This is the first book i have read by this author so had no idea what to expect with this book, i loved this book way more than i expected. I loved reading this book, there were so many unusual ideas in this book that were so unexpected. There is a lot of aspects to this book but it doesn't come across as too much o too rushed, everything that happens in this book happens at the right pace and i adored the surprise at the end, i definitely didnt see that coming and i am now dying to find out what happens next in this world.The storyline was out of this world, there is no aspect of it that is predictable, there really are surprises around every corner and you really don't know what is going to happen next and i loved that about this book, the fact that you are kept on your toes from the first page to the last page was such an experience to read! I have honestly never read anything even similar to that and i love that!!! After reading this tale i am definitely hooked on this author's work and i can't wait to read more of her work!The characters were so diverse in this book and i loved how the author took characters from completely different worlds and different places in life, people that would not normally meet and put them together for the same purpose showing that it doesn't matter where you come from or how you live, inside we are all the same! I loved Trattora, she is such an enjoyable character to read about. Throughout the book you really see her change and cone into her own and i love how easily she seems to be able to adapt to situations that she had never encountered before with a calm and confident manner. I loved Velkan, i loved reading about his character, there is so much depth to him and throughout the book you only scratch the surface, he is extremely loyal to those that he cares about and will do pretty much anything to protect those loved ones. I could read about these two all day.I can't recommend this book highly enough, this author is so talented and the way she is able to write this story in such an imaginative and completely vivid way in inspiring, this author is a definite must read!!! I received an ARC in exchange for an honest review. This is a fun book. There are many twists and turns. The characters are pretty well developed. The author did a great job of putting me into the world she has created. The world is well developed and interesting.I wanted to keep reading and I will read the rest of the books in the series. I want to know why the babies were sent away and would love to see the AI that is at the root of the beginning of the book more explained/developed.The relationships are intricate and it was great to see the loyalty and understanding amongst her, her best friend and the slave they meet that is like her. I don't every give spoilers (at least not intentionally) but this is worth a read if you enjoy future novels set in space. There are a couple of areas that were a little harder for me to believe in but I am hoping that they will make more sense in the future novels. At a minimum, this was a fun, interesting, relatively fast read. Loved this book! When an Artificial Intelligence is about to take over a planet, a few parents send their very young children into space, and eventually to another planet, away from the invading AI. This book has well developed characters, even the parents that appear for only a short time. The plot is great and easy to follow. I am not usually into SF reading, but I can't wait for the next book in this series! I voluntarily reviewed an ARC copy of this book. Reviewed for readers favoriteGirl of Fire by Norma Hinkens is the first book in The Expulsion Project, a light sci-fi action adventure trilogy.Trattora is the chief's daughter in a backwater frontier planet. Adopted at a young age, her red hair is distinctive as is her curiosity.Then one day a ship comes to her home planet and she finds herself instantly connected to one of the crew, a serf by the name of Velkan. Their connection is strong especially when they discover they both have matching bracelets. The only hint to their shared past.Unfortunately, space pirates invade the planet and their forced to flee for their lives. It takes them on a journey of mystery, treachery and found families.I enjoyed Girl of Fire by Norma Hinkens. 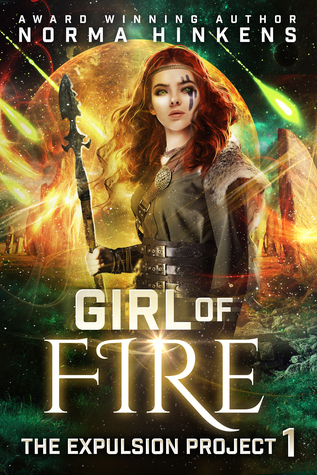 It was a light fast paced read that should be easily enjoyed by fans of Cinder.Girl of Fire grabs you by the first chapter and once captured refuses to let go.Trattora is a capable heroine and full of curiosity. She has a great support network of friends and while the romance between her and Velkan is a bit sudden, it's also cute.There were a lot of double crosses throughout and Girl of Fire is filled with twists and revelations.Hinkens created such an engaging wood that I'm curious to know what's going to happen in the next book. I would love to learn more about Preeminence and Trattora's true home planet of Mhakerta.A great read for any fan of light science fiction and fast paced intergalactic adventure. *This was an ARC from the author in exchange for an honest review*The publishing was dead wrong on this one. To compare this book to any of the series mentioned actually does it a disservice. It was a very unique story line with unique characters that really should not be compared to others that are out there.The author does an amazing job building several new worlds for us, the readers to explore with the main characters Trattora and Velken. Both were children sent away by their parents to avoid an AI controlled world. Trattora was traded to a chieftain and grew up privileged while Velken became an indentured servant to a group that pretty much amounted to space pirates. The plot is well-paced and leaves you turning pages well past your bedtime. Great beginning of the series!Absorbing take of parents sacrifice to save their young children from grim fate. The children grow up on a different planets but eventually meet each other. Their is love connection there, friendships, terrible betrayals and great adventures. 4 1/2 starsI really enjoyed this novel. I'm not a huge sci-fi fan, though I do love a good sci-fi movie or show every now and again, but this book managed to hold my attention all the way through. It's packed with adventure and thrilling moments, and is written from the POV of a young female. This book is ideal for fans of sci-fi & adventure, especially those geared toward ya reading audiences. Girl of Fire (The Expulsion Project #1) by Norma Hinkens Book ReviewIf Firefly were to be made into a modern day CW Teen Drama, it would look a whole lot like author Norma Hinkens book, "Girl of Fire (The ExpulsionProject #1)." A fast paced adventure that explores a whole new galaxy filled with androids, cyborgs and warring worlds, this is a fantasticsci-fi world that fans will want to dive head first into. Here is the synopsis:ORIGIN. DESTINY. FATE. How far would you go to unravel the truth?Trattora is the adopted daughter of the Chieftain on a primitive frontier planet. Velkan is an indentured serf who has never known a day of freedom. Forced to flee an invasion by Galactic Pirates, they find themselves thrown together on a ramshackle mining vessel that harbors more than one dark secret. Fate and chemistry combine when the pair’s matching birth bracelets lead them to a shocking discovery about their true lineage. Stakes rise when they uncover the classified Expulsion Project, and the devastating sacrifice their birth families made to spare their lives. Determined to save them from liquidation, Trattora and Velkan plunge headlong into a race against time and space to take down the genocidal self-actualizing software that now controls large swathes of their home planet.But will they navigate the treacherous dealings of the seedy Galactic underworld in time to rescue the families who loved them enough to let them go?Girl of Fire is the first novel in The Expulsion Project, a sci-fi, dystopian thriller trilogy with a whisper of romance, a heavy dose of adventure, and action galore. If you are a Firefly or Dark Matter fan, or in Divergent withdrawal, this is the book mashup for you!This was an edge of your seat read, filled with lots of action, great character growth and phenomenal chemistry between the characters. From thefirst pages of this book you get a sense of the scope of this galaxy, and the differences that separate the worlds. Getting to see how thesecharacters started off from the same world and then grew up to be so different was fun to see unfold within the plot, and the story itselfhad me invested and hooked immediately. Much like the supporting characters of the book, one can't help but feel enthralled with protagonist Trattora and her bravery. Raised on a loneplanet for most of her life, she isn't afraid to be herself and goes to extreme lengths to save the people who matter to her. With a sense of justice and pride she throws herself into danger, and takes charge when decisions need to be made. Overall, this is a must read novel for YA science fiction fans. Readers will love going on this adventure as they delve into the lives of Trattoraand her friends as they explore harsh worlds and seedy cities in the galaxy. The action and shocking cliff-hanger will keep fans invested for this exciting new series, so be sure to get your copy of "Girl of Fire" today! In the final days before the planet of Mhakerta becomes overrun by the self aware A.I. 's created there, five scientists choose the unthinkable. They load their only children into individual pods, sending them through space in the hopes that they arrive to another planet safely. The only reminder of where they came from are matching bracelets with each child's name engraved. Trattora is the adoptive daughter of a chieftain on a small primitive planet. When the first mining vessel in 14 years lands on her planet, she meets Velkan, the indentured servant of the mining vessel's captain. When the Maulers (galactic pirates) invade, the only chance Trattora has to get away is to join Velkan on the mining vessel. Once on board, Trattora learns they have more than chemistry in common. They also have matching birth bracelets. Together they discover the 'Expulsion Project' which included how they came to their planets, as well as the sacrifices their parents made so they could live. Determined to save their birth families from the A.I. 's imprisoning them, Trattora and Velkan embark on a dangerous journey across the galactic system. Norma Hinkens, the amazingly talented author who brought us the 'Undergrounders Series', has once again blown me away with 'Girl Of Fire', the first book in 'The Expulsion Project'. A mixture of Dystopian Sci-fi, with a sweet blossoming young adult romance, it has everything I search for in a great book! On parr with 'The Hunger Games', better than 'Divergent', and with just a hint of the scheming found in 'Game of Thrones', this is sure to be a hit for the young and not so young alike. If you like your heroines with brains and backbone (think Katniss), then you are sure to love Trattora. While she may not have all the answers, you can rest assured she will not stop until she finds them. A true leader, she's quick on her feet, witty, loyal, and is not afraid to take chances. The supporting cast is also wonderfully done well which gives the book great well rounded balance. One of my favorite characters may just be the edgy Sarth. She may be the resident 'baddie', but there's something I loved about her jaded personality. The author builds an intricate world that you could close your eyes and 'see' vividly. Add to that a well executed storyline with several convoluted twists and turns, and you are sure to find yourself engrossed long into the night. Overall, a spectacular start to what promises to be another amazing series by Norma Hinkens. I received this book in exchange for an honest review. All reviews are based solely on my humble non important opinion. Trattora and Velkan are two teenagers, each of mysterious background, but who clearly have a common origin, even though they've never met.Trattora has grown up a chieftain's daughter on a rather backward and isolated planet, while Velkan has grown up a serf--essentially a slave--on a trading ship whose owner-captain, Sarth, is not overly concerned with the law.Trattora has always known she was adopted, brought to the planet Cwelt by the last trading ship that reached them before Sarth's. It doesn't take the two young people long to discover that they each have one item from their unknown parents: bracelets identical except for the name engraved on it.Trade negotiations are already not going well when it's discovered just how much Sarth doesn't care about the law, and Trattora is determined to save her new friend regardless of the risks. But when Marauders show up, Trattora's people have no option but to hide in the caves, while Sarth, her crew, Trattora, and two other Cweltans are near enough to Sarth's ship that getting off planet fast is the better choice.What follows is adventure, treachery, and derring-do, much of it wildly improbable. Trattora often seems simultaneously too naive, given her age and her upbringing as a chief's daughter, and too sophisticated, given her upbringing on a backward world, with no direct experience of high tech except the education programs her father bought for her at the same time he bought her from that last previous trade ship. They visit a prison planet, a couple of trading worlds, and finally Aristozonex, where Trattora and Velkan hope to finally track down some real information on their parents, how they came to be living in such different circumstances, with only the identical bracelets as clues to their origins.There are many problems with the book, some already mentioned. I don't think enough thought went into the world building, though I could be proven wrong in subsequent books in the series. It is nowhere explained why the Cweltans use "moons" to refer to years, i.e., it has been fourteen "moons" since Trattora arrived and was adopted by parents, and she's now clearly in her late teens. It's silly stuff.And yet I liked the characters, and enjoyed both their developing personalities and relationships, and the often silly plot. This won't be on anyone's nominations lists, but it is an enjoyable read.Recommended on that basis.I received a free electronic galley of this book and am reviewing it voluntarily. I received a copy of this book in exchange for an honest review. Normally I don’t read sci-fi but I love Norma’s dystopian stories so I couldn’t resist.Trattora the main character is a strong young independent girl, I loved how brave she was and how she took matters into her own hands. Velkan was always a slave never free but what has his past to with Trattora’s past and why do they have same necklace? I liked this story but didn’t love it and it has nothing to do with the story or the writing, this genre is just not my kind off cookie. This book has a lot of twist, action and is fast paced.Don’t miss out on a great read give this book a try.Love the cover. Five out of five stars. It will come as no surprise to most of you that I was very excited to read Norma Hinkens’ book Girl of Fire. Not only is it science fiction, it is clean, action adventure science fiction! So many wins, so little time.Trattora is a young girl in training to succeed her adoptive father as the chieftainess of a primitive tribe of hunter-gatherer humans living on a mostly ignored planet in a seldom-traveled part of the galaxy. She desperately wants to know where she is from, but she has no clues except for a bracelet with her name and birthdate inscribed on it, which she was found with. Trattora, with an inclination towards risky behavior and a yen to visit the Nethersphere, as she calls the space between planets, soon finds herself embroiled with oremongers who have a particular interest in her planet. She moves from disaster to disaster, complication to complication, all the while trying to both save her adoptive tribe from an immediate threat and discover what she can about her origins.Hinkens’ writing drew me in immediately. She conveys a wide, rich universe with motivated characters who work for their goals, and creates conflict in meaningful ways. Although the book includes some typical YA tropes – teenagers on a quest to save the world, no responsible or trustworthy adults in sight, too smart for their own good – Hinkens manages to use every bit of story to engross the reader and catch them up in a whirlwind of tension and zigzagging plot lines.If you enjoy science fiction and young adult books such as CinderCinder by Marissa Meyer, Megan Whalen TurnerThe Thief by Megan Whalen Turner, or Brandon SandersonBrandon Sanderson’s YA books, you will definitely enjoy Girl of Fire.I rate it for 14 and up on the Aardvark scale for physical violence and peril. I received a complimentary copy of this book in order to review it. I would like to thank the author for granting me an ARC copy of this book in exchange for an honest review.Girl of Fire is the start of an action packed, dystopian/ sci-fi thriller trilogy. The story begins on a planet soon to be taken over by a computer program turning more intelligent and violent towards humans. A group of humans start a secret group known as the Expulsion Project which entails them to send their children into space to save them from the horrors that await them if they stay. Fourteen years later we meet Trattora, the adopted daughter of a Chieftain on a far-off borderland planet and Velkan, the serf, or slave, of a ship trader. When fate puts these two together they are forced to escape Trattora’s planet before pirates arrive to forcibly take over the planet. Torn about leaving her family behind, Trattora vows to find help for her people. When these two discover they hold matching bracelets from a past they know nothing about, they set out for answers and discover a world of secrets, betrayals, adventure and love they never knew existed.I have to say that this book was amazing. I love Norma Hinkens other trilogy and dare say this one is even better! She has such a smooth and flowing writing style that keeps you engrossed in the book well beyond your usual bedtime. I enjoyed the new world and loved the characters. There was never a slow moment in this book. If you’re looking for a short, fast read you will not go wrong with this book. I really can’t wait to see what awaits these characters in book two! I recommend this book to both young adults and adults. Anyone who loves action, mystery and sci-fi stories will greatly enjoy this book.Final Rating: 5 Stars. Well earned!